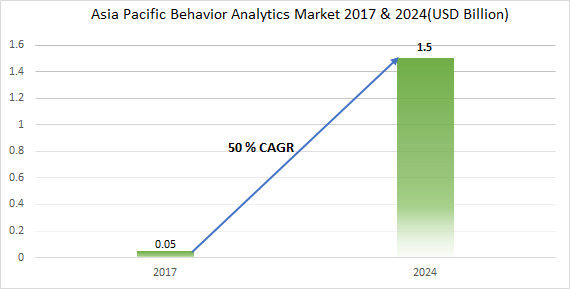 APAC Behavior Analytics Market size in 2017 was estimated to be over USD 50 million and is anticipated to grow at a CAGR of about 50% from 2018 to 2024. Asia Pacific behavior analytics market is driven by the increasing number of smartphone users in the region. This growth is fueled by the availability of low-cost smartphones along with the rollout of 3G and 4G LTE technologies. This has led to a widespread adoption of mobile & web-based applications and the towering need to protect them has fostered the behavior analysis solutions. These solutions are used to identify inefficiencies in the network structure to reduce the security vulnerabilities associated with them. In addition, the inefficient regulatory landscape has resulted in the growth of cybercrimes across the region. The BFSI sector is estimated to account for more than 22% share in the Asia Pacific behavior analytics market in 2016. The financial service sector has become a target of choice for various malicious players exploring numerous avenues to identify vulnerabilities in the security systems. In response to these growing threats, the financial institutions are bolstering their defenses by investing in the latest cyber security technologies, nurturing the growth in the market. The healthcare sector is expected to grow over 50% during the forecast timespan. The growing number of cyber-attacks across various healthcare establishments has propelled the growth in the market. The behavioral analysis solutions are used to identify and respond to these threats in real time and to protect the patient data. These solutions are also used to protect the reputation of the healthcare organizations, preserve the patient trust, and enable healthcare professionals the access to patient data. China is leading the Asia Pacific market as it is the source of more than 25% of revenue in 2016. Over the last decade, businesses in China have deployed various software solutions to control identity access through the access management systems. However, the emergence of cloud technology, distributed applications, mobile workforce, and dynamic business opportunities has resulted in the massive management & security crisis, which has supported the market growth. The behavior analytics market ecosystem consists of software developers and application designers, mobile security and application developers, cloud services providers, system integrators, and managed service providers. Some of the major players in the market are McAfee, Splunk, Bay Dynamics, Gurucul, Avtex solution, E8 Security, Sqrrl Data, Exabeam, and IBM Corporation. These companies are forming strategic alliances to expand their market presence in the region to gain an edge over its competitors. For instance, Gurucul has partnered with Exclusive Networks to increase it channel footprint and market share in the Indian market. It aims at focusing its efforts toward the metropolitan cities to identify the potential partners in the IT, BFSI, and healthcare sectors.